There have been dramatic increases in the number of coronary artery bypass surgeries (CABS) and percutaneous coronary interventions (PCI) performed during the last decade. Whether this finding is true for revascularization procedures performed in Department of Veterans Affairs (VA) medical centers is the subject of this paper. This study compared the number of revascularization procedures and rates of use in the VA, the National Hospital Discharge Survey, and the Nationwide Inpatient Sample. Included were men who underwent isolated CABS and/or PCI, including stenting, between 1991 and 1999, although data for the Nationwide Inpatient Sample were available only between 1993 and 1997. Age adjusted use rates were calculated with the direct method of standardization. The percent of users of VA healthcare 75 years and older increased from 10% in 1991 to 20% in 1999. In the VA, the number of isolated CABS declined from 6227 in 1991 to 6147 in 1999, whereas age adjusted rates declined from 167.6 per 100,000 in 1991 to 107.9 per 100,000 in 1999. In the 2 national surveys, both the estimated numbers of procedures and use rates increased over time. In all 3 settings, there were increases in both numbers and rate of PCI from 1993, although in the VA, use rates decreased from 191.2 per 100,000 in 1996 to 139.7 per 100,000 in 1999. VA use rates for both CABS and PCI were lower than those in the 2 national surveys. Age adjusted rates of CABS and PCI were lower in the VA than in 2 national surveys. Since 1996, there has been a decrease in the rate of use of revascularization procedures in the VA. According to recent estimates from the American Heart Association, the number of cardiovascular operations and procedures performed in the United States increased 384% from 1979 to 1998. Specifically, the number of percutaneous coronary intervention (PCI) procedures rose 248% from 1987 to 1998, and although not as spectacular, the growth rate for coronary artery bypass surgery (CABS), was also impressive, with an estimated 553,000 cases performed in 1998. Whether these changes for PCI and CABS apply to similar procedures performed in the Department of Veterans Affairs (VA) is a relevant question, as the VA provided health care services to over 3 million veterans in 1999. The comparison between the data sources for all U.S. cardiovascular operations and procedures and VA provision of these services is of interest because of the comparability of the VA health care system with national health care systems such as those in Canada and Europe. The similarity of the VA health care system to these national systems (including global budgeting, regionalization of costly services, and essentially free provision of care to a defined population) creates an important contrast with the remainder of the US health care system. Most of the U.S. health care system is driven by fee-for-service payment, particularly by Medicare in the population receiving cardiovascular procedures. The use of cardiac revascularization procedures, defined as CABS or PCI, represents a distinct philosophy and organizational imperatives concerning the treatment of coronary artery disease. How these expensive procedures are used is an indication of how scarce health care dollars are allocated. 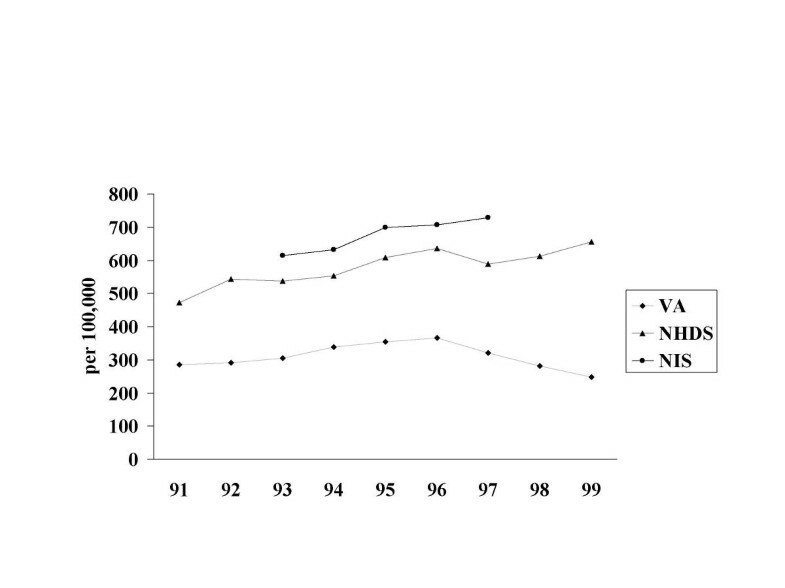 The first objective of this paper is to compare over time CABS or PCI use separately for the VA, NHDS, and NIS; for example, within the VA from 1991 through 1999 were there discernible trends in the use of CABS? A second objective is to compare age adjusted use rates in the VA with estimates from the 2 national databases. The VA Patient Treatment File includes records of all hospitalizations occurring in all VA medical centers from 1970 to current; it has several components, which contain extensive demographic and service eligibility information, and procedures performed in the operating room as well as those performed in other hospital locations, including the cardiac catheterization laboratory. Procedures are indicated by International Classification of Diseases 9th Revision Clinical Modification (ICD-9) codes; there is extensive coding of procedures with a maximum of 5 codes per surgery performed in the operating room and a similar maximum per each procedure performed outside the operating room, with a maximum of 32 separate entries per hospital stay. The database includes a record linkage number making it possible to link to other VA data files as well as to identify individuals with multiple hospitalizations. For this study, VA hospitalizations for the years 1991 through 1999 were used. The National Hospital Discharge Survey is an annual sample of hospital discharges from nonfederal hospitals located in the 50 states and District of Columbia. The current study uses survey information for the years 1991 through 1999 (approximately 2 million hospitalizations). As in VA databases, coding of procedures is with ICD-9 procedure codes, although coding is not as extensive, with a maximum of 4 procedures per hospitalization. There is also limited demographic information including age, gender, race, and geographic region of the hospital, although the hospital itself is not identified. Unlike the VA, there is no record linkage number to permit identification of individuals who are hospitalized more than once. Sampling weights are provided for calculating national estimates of the number of hospitalizations for specific cardiovascular procedures. The Nationwide Inpatient Sample of the Healthcare Cost and Utilization Project is a 20% random sample of all hospital discharges from selected hospitals in participating states. Hospitals and state organizations that agreed to release their discharge data for research purposes were randomly selected according to a sampling frame based on ownership control, bed size, teaching status, urban or rural location, and geographic region. Since its inception in 1988, the number of hospitals sampled and number of states participating have increased from 11 in 1991, to 17 in 1993, and to 22 in 1997, when there were over 7 million discharges in 1000 hospitals. As in the other 2 data sources, procedures are identified with ICD-9 procedures codes, with a maximum of 15 codes per hospital stay. The Nationwide Inpatient Sample does not include a record linkage number for identifying individuals who have been hospitalized more than once, but it does identify the hospital and generally has more information than the National Hospital Discharge Survey. It also provides case weights for generating national estimates of cardiovascular procedure use. For purposes of this report, hospital discharges for the years 1993 through 1997 were used, with 1997 being the most current year for which discharges were available. For each data set, hospital discharges with evidence of coronary revascularization procedures were selected by employing specific ICD-9 procedure codes. CABS was defined as procedure code 36.1x; discharges with concomitant procedures involving the valves or septa of the heart (code 35.x) were excluded, so that only isolated procedures were selected. PCI included hospital discharges with procedure codes 36.01, 36.02, 36.05, or 36.06, with the latter code indicating coronary artery stenting. Since the code for stenting was implemented in October 1995, rates of stenting are reported for the years 1996 through 1999. In the VA, where it was possible to detect for an individual patient, multiple procedures of the same type performed on the same hospital day, only the first procedure of that type for that day was counted. Procedures occurring on other days of the same hospitalization were also included. Since over 90% of VA users are men, this study does not include women, and given that use of these procedures is rare in children and young adults, only individuals 20 years and older were included. For purposes of comparison among the 3 data sources, age, race, and geographic region of the hospital were also collected. Race was categorized as white, black, other, or unknown. Geographic region was defined as Northeast, Midwest, South, or West. The Northeast region included hospitals located in the states of Connecticut, Maine, Massachusetts, New Hampshire, New Jersey, New York, Pennsylvania, Rhode Island, and Vermont. The Midwest region had the states of Illinois, Indiana, Iowa, Kansas, Michigan, Minnesota, Missouri, Nebraska, North and South Dakota, Ohio, and Wisconsin. The largest region in terms of number of states was the South: Alabama, Arkansas, Delaware, District of Columbia, Florida, Georgia, Kentucky, Louisiana, Maryland, Mississippi, North and South Carolina, Oklahoma, Tennessee, Texas, Virginia, and West Virginia. Last, the West region had the following states: Alaska, Arizona, California, Colorado, Hawaii, Idaho, Montana, Nevada, New Mexico, Oregon, Utah, Washington, and Wyoming. Denominators for calculating age specific rates for the National Hospital Discharge Survey and the Nationwide Inpatient Sample were obtained from the US census for the years 1991 through 1999. The numbers of men in age categories 20–34, 35–49, 50–64, 65–74, and ≥ 75 were reported for each year. For the VA, the numbers of unique users of VA healthcare services were obtained from the Outpatient Care files. The numbers of eligible male veterans who had at least one visit to a VA healthcare facility were reported for the years 1991 through 1999 using the same age categories as for the 2 national surveys. It is important to recognize that 2 of the data sources in this study included samples of hospitals, whereas the VA contained all hospitals and procedures. For the National Hospital Discharge Survey and the Nationwide Inpatient Sample, we obtained national estimates of the number of revascularization procedures by employing case weights. Age specific rates of use for each procedure were determined by dividing the number of procedures by the number of men in the specific age category for that particular year. Age specific use rates were standardized by the direct method to create age adjusted-rates for each year; the 1999 US male population 20 years and older was used as the standard. Rates are expressed as the number of procedures per 100,000 population. The Chi-square for trend statistic was used to determine if there was a statistically significant increase or decrease in use rates within the VA and NHDS. There were 58,807 isolated CABS performed in 43 VA medical centers from 1991 through 1999; distributions of age, race, and geographic location of the medical center are shown in table 1. For the National Hospital Discharge Survey, there were 16,540 hospitalizations for isolated CABS, and in the Nationwide Inpatient Sample, there were 54,218 procedures done in 1997. These cases provided the basis for the national estimates presented in table 2. VA-Veterans Affairs NHDS National Hospital Discharge Survey NIS Nationwide Inpatient Sample from the Healthcare Cost and Utilization Project NA not available. In general, the mean ages of men undergoing CABS were similar in the 3 datasets, although the VA had a lower proportion of individuals in the 75 years and older category. 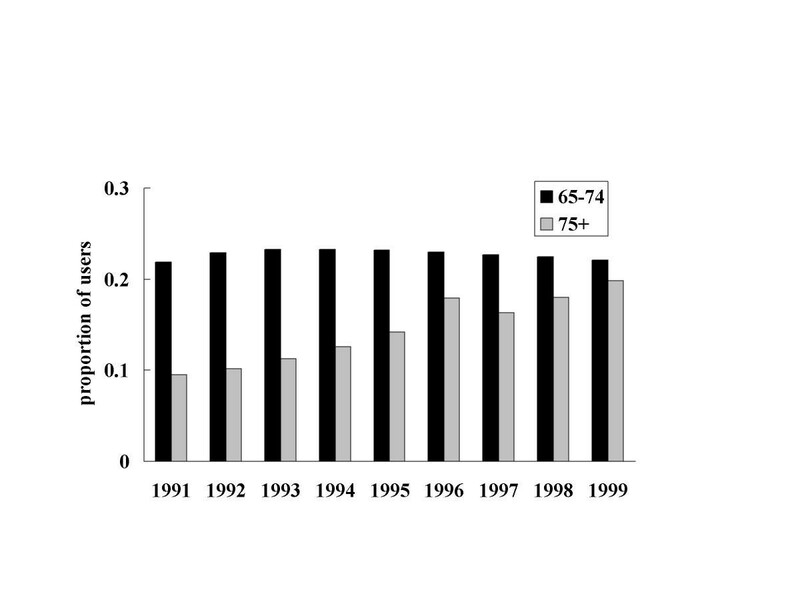 However, in the VA the proportion of users 75 years and older increased from 10% in 1991 to 20% in 1999, as seen in figure 1. In the United States as a whole, the proportion of men 75 and older was relatively constant over the 9 years (5.6% in 1991 versus 6.6% in 1999). These men were predominantly white, although the significant proportions of unknowns in the National Hospital Discharge Survey and Nationwide Inpatient Sample hindered comparisons across the 3 databases. There were significant differences with respect to geographic location of the hospitals where these procedures were performed. In the VA, over 40% of hospitals were located in the South, whereas in the National Hospital Discharge Survey and Nationwide Inpatient Sample, the distributions were more balanced, although the latter had a higher proportion of institutions located in the Northeast region. Presumably, these differences were due to sampling strategies employed in the 2 surveys of hospitals. The results for PCI mirror those for CABS, as seen in table 1. In the VA, there were 51,509 hospitalizations performed in 51 medical centers. Rather than combine all 5 years of the Nationwide Inpatient Sample, we report baseline characteristics for 1997, the most recent year for which these data are available. Noteworthy findings have to do with the lower proportion of veterans in the oldest age category and the predominance of VA medical centers in the South region. In the VA from 1991 through 1999, there was a 35.6% decrease in utilization rates for CABS and a 1.3% decrease in the total number of procedures performed (table 2). This decline was highly statistically significant (p < 0.0001 by Chi-square for trend). The trends for the 2 national samples were quite different. In the National Hospital Discharge Survey, there was a 6.8% increase in utilization rates, as well as a 23.6% increase in the estimated number of procedures (p < 0.0001). In the Nationwide Inpatient Sample, utilization rates from 1993 to 1997 increased 8.6% and the estimated number of procedures went up by 16.4%. Utilization rates were lowest in the VA, and were considerably higher in the 2 national samples. It is also noteworthy that beginning in 1995, utilization rates for CABS declined in the VA and National Hospital Discharge Survey. Overall, PCI rates in the VA increased 18.3% from 1991 to 1999, and the number of procedures increased 75.6% during the same period (table 3). This increase was highly statistically significant (p < 0.0001). 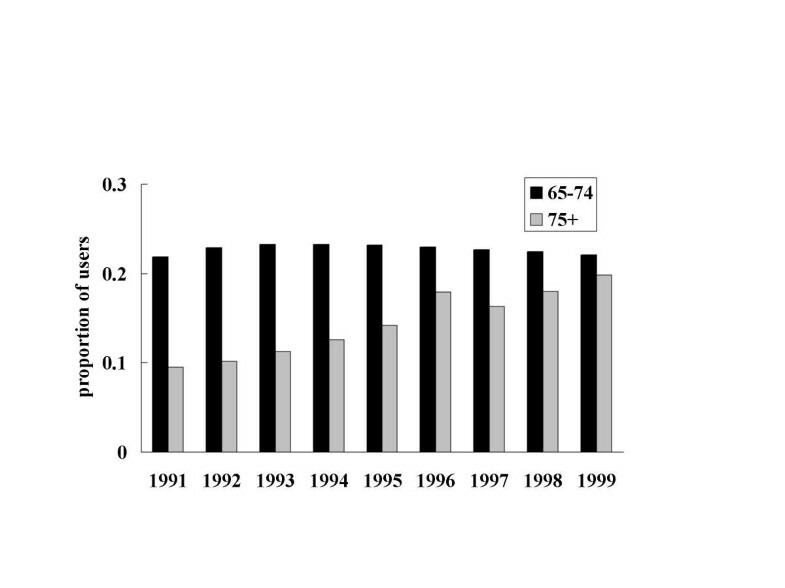 As with CABS, there was a decline in utilization rates starting in 1996. In comparison to the VA, in the National Hospital Discharge Survey, there were dramatic increases in utilization rates (66.9%), and the rise in the number of procedures was also higher than in the VA (95.5%) (p < 0.0001). In 1997, there was a decline in both rates and numbers of procedures, but in 1998 this trend reversed with significant gains for both 1998 and 1999. In the Nationwide Inpatient Sample, where there were only 5 years of data, utilization rates increased 26.8% and the number of procedures went up 36.5%. Significant gains in the use of stenting were evident in both the VA and National Hospital Discharge Survey. As was the case with CABS, PCI rates were lower in veterans than in the other 2 settings. The findings for revascularization defined as CABS and/or PCI mirror those for the individual procedures, as seen in figure 2. The results of this study demonstrate considerable variability in the use of coronary artery revascularization procedures in VA and non-VA hospitals. In the VA, not only were overall rates lower, but also both the number of CABS performed and age adjusted rates declined from 1991 to 1999, whereas in the National Hospital Discharge Survey and the Nationwide Inpatient Sample, both the estimated number of procedures and age adjusted rates increased during the time for which data were available. The findings for men undergoing PCI were somewhat different in that in all 3 settings there were increases in both the number of procedures as well as the age-adjusted rates. However, in the VA starting in 1996 there was a noticeable decline in the age-adjusted rates of both PCI and CABS; this decline was also evident in the National Hospital Discharge Survey for CABS. Age adjusted rates of CABS and PCI were lower in the VA than in the other 2 settings, but it is important to put these rates in perspective. In 1993 in New York State, the age adjusted rate of isolated CABS for all patients was 120.6 per 100,000, somewhat lower than the VA rate of 166.0 per 100,000 for men. By contrast, the age adjusted rate for CABS in Ontario, Canada, was only 67.4 per 100,000. Presumably, the rates for New York State and Canada would be higher if only men were included. A similar pattern was apparent for PCI; in New York State, the age adjusted PCI rate for women and men was 127.8 per 100,000, very similar to the VA rate of 139.8 per 100,000 and higher than the Canadian rate of 57.2 per 100,000. The comparison of VA rates to those in New York State and the province of Ontario in Canada is relevant because of the similarity to the VA health care system in the key dimensions of global budgeting and regionalization of services. Hospitals in New York State are heavily regulated compared to most of the rest of the United States. They are capped in the amount of budget growth annually, and provision of costly, highly complex services such as CABS and PCI is limited. Similar constraints are in place in the province of Ontario, to an even greater degree than in New York State. There are several explanations as to why age adjusted rates in the VA were lower than those reported in the 2 national surveys. First, not all veterans who are users of VA healthcare services undergo coronary revascularization procedures in VA hospitals. [7, 8] This may be particularly true for veterans who are eligible for Medicare and receive treatment for acute coronary syndromes in non-VA hospitals that are closer to their residences and have cardiac catheterization and open heart surgery facilities. For veterans undergoing elective procedures, it may be that they lived far away from one of the 51 hospitals that performed CABS and/or PCI and elected to undergo procedures closer to their homes. In short, veterans undergoing revascularization procedures in non-VA centers were not included in the age-adjusted rates reported in this paper, and this in part could account for the lower rates. The extent to which veterans of all ages undergo revascularization procedures outside the VA is not known. It is also possible that older veterans were not candidates for the CABS or PCI due to excessive comorbidity; there is evidence that older veterans may have poorer health than non-veterans or veterans who are hospitalized in non-VA facilities. [9, 10] Finally, although there is no evidence to support this, decision making for revascularization procedures may be more conservative in the VA.
An explanation for the decline in use rates may have to do with the rapidly aging veteran population. The number of veteran users age 75 and older increased 177% from 210,000 in 1991 to 582, 000 in 1999, whereas the US male population 75 years and older increased only 27% from 4.8 to 6.1 million. Veteran users 75 years and older comprised almost 20% of the veteran population in 1999, yet in the US, men 75 and over accounted for only 7% of the male population 20 years and older. This higher proportion of older veteran users, coupled with the fact that comparatively fewer older men underwent revascularization procedures in the VA, may in part explain the decline in use rates in veterans. The results of this study must be considered in the light of two limitations. First, it is important to recognize that the age adjusted rates from the 2 national surveys were estimates based on case weights. The 2 surveys produced somewhat different estimates of both the number of procedures performed and age adjusted rates, because in part, the surveys probably selected different hospitals. While these surveys include hospitals representative of those in the United States, they do not necessarily contain hospitals that are indicative of those performing cardiac revascularization procedures. These differences may also be due to the fact that the Nationwide Inpatient Sample reported up to 15 procedure codes as opposed to only 4 in the National Hospital Discharge Survey. The number of codes reported in the VA was much larger, but this did not result in higher use rates for the VA.
Due to both sampling and coding issues, the national surveys may incorrectly estimate the number of revascularization procedures. Using the Nationwide Inpatient Sample, which identifies the hospital, we estimated age-adjusted rates for CABS and PCI in New York State for 1993. The age adjusted rate of CABS for both women and men in New York State was 198 per 100,000, which is higher than the 121 per 100,000 reported by Tu et al. , who had counts of all surgeries performed in New York State. On the other hand, our counts of CABS were estimated by applying case weights to the hospitals in the survey. The situation with respect to PCI was different; the estimated age adjusted rate for New York in 1993 in the Nationwide Inpatient Sample was 142 per 100,000, similar to 128 per 100,000 reported by Tu et al. A second limitation of this study has to do with the choice of denominators. For the 2 surveys, the United States male population 20 years and older was used, whereas in the VA, the number of eligible veteran users was employed. As has been seen, the proportion of older individuals in the US census was relatively constant, whereas in the VA the proportion of users 75 years and older doubled during the study period. The VA denominators include users of health care, whereas the denominators for the national survey include both users and non-users. Given potential over-estimation of the number of procedures in the 2 national surveys, possible under-estimation of the number of procedures in the VA, and differences in the types of denominators, it is possible that age adjusted rates of procedure use were too high for the national surveys and too low for the VA. In summary, national hospital discharge databases reported dramatic growth in the use of cardiac revascularization procedures, although the use of CABS declined slightly with the advent of stenting, which has reduced the need for emergent bypass surgery. In the VA since 1991, there has been a decline in both the total number and rate of CABS performed, and since 1996, a decline in age adjusted rates of PCI. These declines are most likely a function of several factors, including increasing substitution of PCI for CABS and the aging of the veteran population, as well as its overall poorer health. CM-Formulated hypothesis, study design, collected and analyzed data, interpreted results, drafted manuscript. AES-Drafted manuscript and provided critical comments.